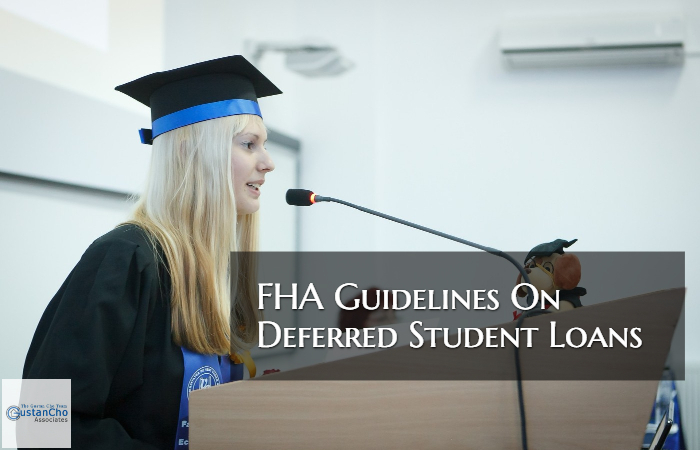 Per FHA Student Loan Guidelines To Qualify For Mortgage, Deferred Student Loans that has been deferred 12 or more months is no longer exempt from debt to income calculations on FHA Loans. Lender Overlays are when a lender has higher FHA Requirements than those of HUD Guidelines. Under option #2, the borrower does not need to take their student loan out of deferment. They can just get a printout of the terms and conditions if the deferred student loan were to be out of deferment. Borrowers with large balances on their Deferred Student Loans can have issues when qualifying for a FHA Loan. If we take a loan case scenario where a borrower has $100,000 in deferred student loans and go over this scenario on how to make it work. Conventional Loans does accept IBR Payments if it is reported on credit report. Borrowers with high student loan balances can see if they can qualify for Conventional Loans versus FHA Loans and use the IBR payment versus the 1.0% of the student loan balance. With VA Loans, 5% of the student loan balance is taken and divided by 12. That figure is the monthly student loan payment that is used for debt to income ratio calculations. Deferred Student Loans that has been deferred for more than 12 months are exempt from debt to income ratio calculations on VA Home Loans. Home Buyers who have a large balance on deferred student loans and need a mortgage lender with no overlays to help you, please contact Gustan Cho Associates at 262-878-1965. Home Buyers can text Gustan at 262-716-8151 for faster response or email us with any mortgage inquiries at gcho@gustancho.com. We are available 7 days a week, evenings, weekends, and holidays. Gustan Cho Associates is the national consumer direct division of Loan Cabin Inc. Loan Cabin Inc. is a national five star lender licensed in multiple state with no overlays on all government and Conventional Loans. We have no overlays on FHA debt to income ratios and will go up to 56.9% DTI per the maximum allow under HUD. There are no credit score and DTI requirements on VA Loans. Maximum DTI allowed with Freddie Mac is 50% DTI. What about student loans in collection? How do you go about getting a house if your score is 637? You need to get studend loans out of collections in order to pay qualfiy for collection loans. What if parents are paying my loans? How does that work with FHA? If you can provide 12 months canceled checks that your parents are paying for it, you will be fine. It needs to be 12 months canceled checks from their bank account.